Kidepo Valley National Park is a 1,442 square kilometres (557 sq mi) national park in the Karamoja region in northeast Uganda. Kidepo is rugged savannah, dominated by the 2,750 metres (9,020 ft) Mount Morungole and transected by the Kidepo and Narus rivers. Kidepo Valley National park is located in Kaabong District, in the northeastern corner of Uganda. The park is approximately 220 kilometers (140 mi), by road northwest of Moroto the largest town in the sub-region. It is approximately 520 kilometers (320 mi), by road, northeast of Kampala, Uganda’s capital and largest city. The northwestern boundary of the park runs along the international frontier with South Sudan and abuts against its Kidepo Game Reserve. Dodoth pastoralists and Ik farmers lived in the area before it was gazetted as a game reserve by the British colonial government in 1958. The purpose was both to protect the animals from hunting and to prevent further clearing of bush for tsetse fly-control. The eviction of the resident people and the resultant famine, especially among the Ik, is cited in contemporary protected area management as an example of the unacceptable consequences of not taking community needs into account when designating reserves. The newly independent government of Uganda under Milton Obote converted the reserve into the Kidepo Valley National Park in 1962. The first chief warden of the park was Ian Ross, a Briton. In 1972, Paul Ssali, a Ugandan, replaced him. The park consists of the two major valley systems of the Kidepo and Narus Rivers. The valley floors lie between 3,000 feet (910 m) and 4,000 feet (1,200 m) AMSL. Kanangarok (also spelled Kananorok or Kanatarok) is a tepid hot spring in the extreme north of the park, beside the South Sudanese boundary. This spring is the most permanent source of water in the park. The soil in the park is clayey. In the Kidepo Valley, black chalky clay and sandy-clay loam predominate, while the Narus Valley has freer-draining red clays and loams. Most of the park is open tree savannah. Because of differences in rainfall — with annual averages of 89 centimetres (35 in) in Narus and 64 centimetres (25 in) in the Kidepo basin — vegetation and animal populations vary between the two valleys. Primary grasses in the Narus Valley are the shorter red oat grass and taller bunchy Guinea grass and fine thatching grass. Common trees in the drier areas are red thorn acacias, desert dates, and to a lesser extent drumstick trees. The iconic sausage trees and fan palms line the water courses. Euphorbia candelabrum and the shorter monkey bread (or camel’s foot) and Buffalo thorn trees are also found. Perennial water makes River Kidepo an oasis in the semi-desert which hosts over 86 mammal species including spotted hyenas, lions, cheetahs, leopards, wild dogs, elephants, giraffes, zebras, Cape buffaloes, bat-eared foxes, Rothschild’s giraffes — as well as almost 500 bird species. Streams in the Kidepo Valley are likewise dotted with palms. Higher areas have whistling thorn acacias bush. 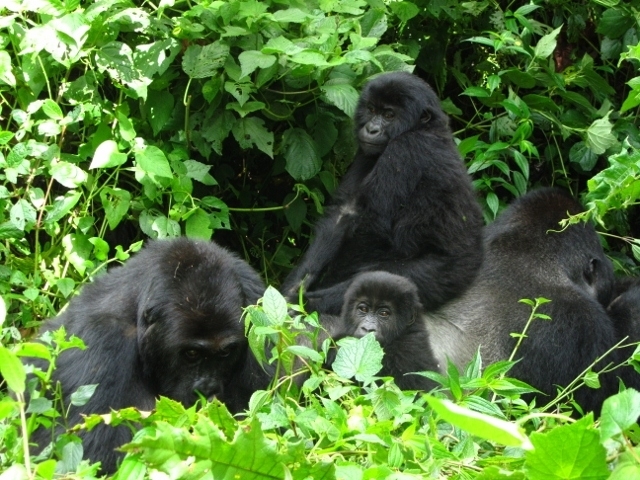 The park is managed by the Uganda Wildlife Authority. The USAID as of August 2013 was financing the improvement of roads within the park. In the fiscal year 2009-2010 Kidepo received 294M Uganda Shillings (US$129k or €99k as of August 1, 2010) from 2100 visitors. By the 2012-2013 fiscal year this had grown to UGX 466M ($178k or €134k as of August 1, 2013) from 2300 visitors. During the 1960s Kidepo had a sustainable Rothschild giraffe population of over 400 animals. By 1992 this had been poached down to only three animals, including a single female. In 1997 Warden Peter Möller obtained funding from the Frankfurt Zoological Society to translocate giraffes from Kenya’s Lake Nakuru National Park. One female died in the holding facility in Lake Nakuru. Two females and one male were flown to Kidepo. In Kidepo one male was eaten by lions shortly after being released.